The heaviest wood in the world is ironwood, which weighs 1122 kilograms per cubic meter. Then what is the lightest wood in the world? It is corkwood originating in America, which weighs only 115 kilograms per cubic meter. An ordinary adult can lift a piece of corkwood as big as 8 times the size of his body. In the 15th century, Columbus discovered America; ever since then, the powers of Europe vied with one another in dispatching colonists to America for the purpose of occupying more land. When the Spanish troops arrived in Ecuador, the soldiers saw seven native girls sitting on a boat made of a special wood on a rushing river. The wooden raft was tossed up and down over the waves, but it never sank into the bottom of the river. The soldiers were quite surprised at this. Afterwards, the soldiers found that the wood which the raft was made of was quite light and had good anti-erosion properties. The local craftsmen made them into various living utensils and craftworks, which were quite popular on their market. Because the wood was quite light, the Spaniards called it corkwood. Afterwards, corkwood was transported to Spain and even the whole Europe; and its use spread to everywhere of the world. Corkwood is widely used in aviation, navigation, sound insulation, heat insulation, and indoor decorations, all having good effects. Corkwood is not only light, white, and mothproof, but also grows very quickly. 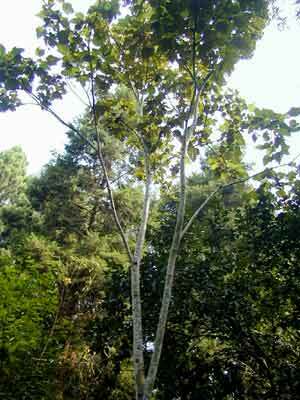 Its trunks are tall and upright with few branches, and leaves are big and round. In the tropical rainforests, corkwood trees look like pretty Dai girls in tight skirts with a green paper umbrella in their hands. Corkwood was introduced into China in the 1960s; now they are planted in Yunnan, Guangdong, Fujian, Hainan, and Taiwan etc.